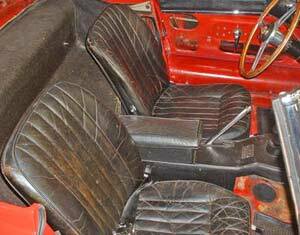 Let's recall how ragged the Jaguar seats looked after 37 years of use. 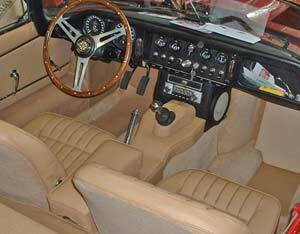 When we left off on the Jaguar's interior we had reupholstered the hated [only the Brits would come up with such a stupid, time- killing] console assembly. 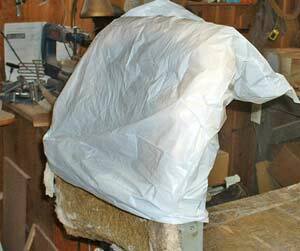 Next came the seats, mainly because there was a spate of cold, rainy weather and we just felt like working in the heated workshop rather than the garage. So, in the philosophy that there is never enough written about how to recover seats, here we go! 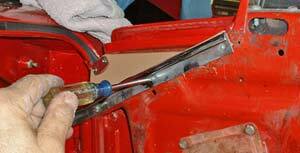 We first took the backs off the seats, a task which (like virtually every other bucket seat) was accomplished by the removal of two bolts on the side. 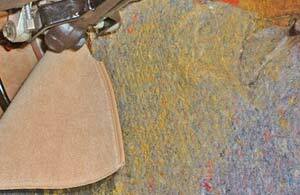 With one of the backs clamped in the vise, it was very easy to take the original leather covers off. They tore apart so quickly that we wondered what had held them together. Once off, the original straw (actually, it's synthetic straw) and cotton batting filler was revealed. 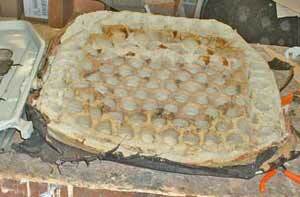 Behind this material was a grid work of fat rubber bands that soak up flex. These rubber bands were in fine shape, as was the straw. 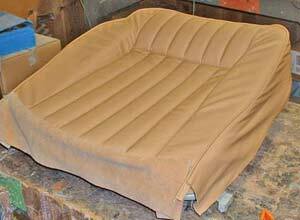 We removed the cotton batting and layered on some rayon filler, then slid the new seat cover over the frame. To let the back seat cover slide on and off easily, we covered it with a plastic trash bag. This was a trip from one of our Second Chance Garage readers that works very well. The cover is almost completely over. 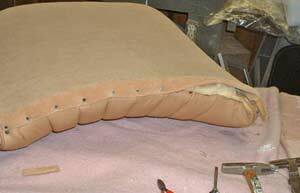 The first time we pulled the cover tight we still had some puckers and loose areas. To remedy the problem we simply pulled it back off and added more filler to the appropriate areas. After a little trial and error the seat back was nicely bolstered and everything fit tight. 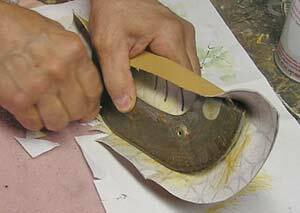 Once we were satisfied with the cover's shape we stapled it down on the bottom (wood) rail, as the original cover had been done at the factory. 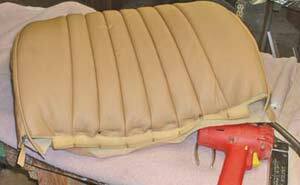 The pleated front of the seat was stapled first, then the wool (moquette) rear cover was folded and stapled and tacked to hide all the crude work. See how nice it looks when it's done right? 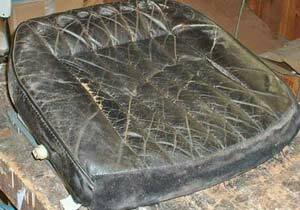 The bottom portion of the seats were the most collapsed and worn, for obvious reasons. 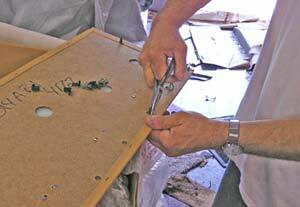 Starting from the bottom, we pulled out all the staples and tacks holding the leather cover and peeled it away from the frame. 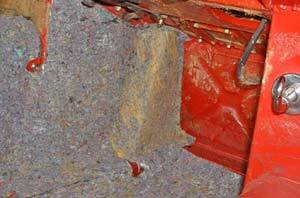 This revealed the old foam rubber cushion that, by this point, was disintegrating. All that stuff went into the trash can. Peeling away the old cover. We couldn't get rid of this old, smelly foam rubber fast enough! At the bottom of the frame was a stretched rubber membrane. We were provided with new ones, so we simply used the old hardware and stretched them appropriately. 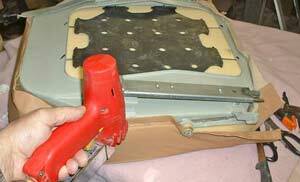 Once the rubber was in place we laid the new foam seat cushion onto it, using just a quick spray of adhesive to hold it in place. The rubber membrane is snugged up. 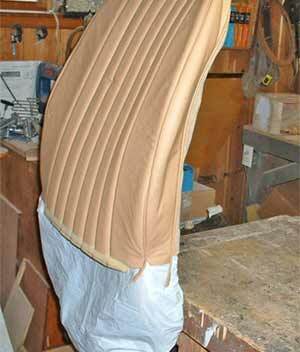 New seat foam ready for covering. 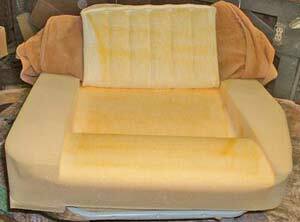 The center of the seat cushion is depressed (for bolstering) so we properly positioned our new cover over the area and then glued the corresponding underside of the cover to the cushion. 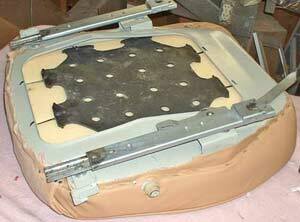 This was the only method (with this seat design) to hold the center section down. With the cover in position, we glued both the underside and the foam. The cover is now ready to stretch over the assembly. Once the center was adhered we proceeded to stretch the cover over the foam and staple it to the underside of the frame. The best technique was to pull the center of each side, staple it, and then work towards the corners. Stapling the cover once it "looked right. 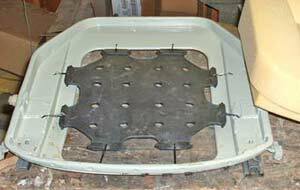 Once we were satisfied that the seats looked good we reassembled the backs to the bottoms and put them aside for later installation. 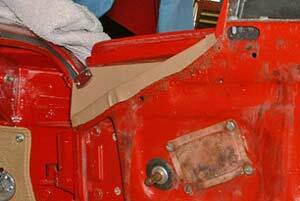 Back in the car, we turned our attention to installing the coverings that hide all the crude sheet metal. The first thing to do was to lay out every piece and place it in the position it occupies in the car. This would rule out any mistakes and help figure out the order of installation (some parts overlap others). The lining sticks to the metal and reveals the contours of the body. 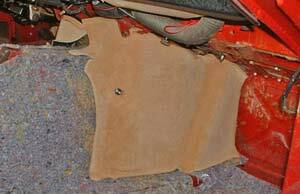 Starting with the floor area, we glued down some aftermarket sound/heat insulation. It's worth it to do this step with any old car. 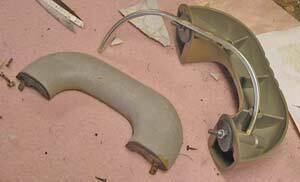 The material is inexpensive and goes a long way toward making the car less rattly and resonant. Next, we started gluing in the carpet and vinyl trim materials. We started at the foot wells and worked our way towards the rear of the car on each side. The only trick in to this part of the project is to stop and think which pieces overlap the others and which ones you can put in without getting them soiled later. 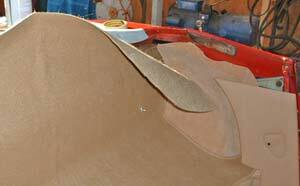 Here's where we started gluing in the vertical carpet piece that forms the cowl area. We glued a small portion at a time to prevent getting it in crooked. Here's what it looks like when glued into place. 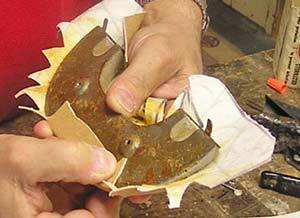 Note that you have to cut materials to reveal things like fastener posts, wire holes, etc. 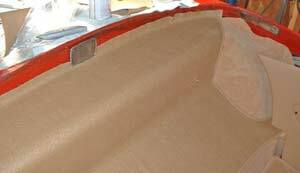 Adhesive sprayed on the lining to receive the driver's carpet covering over the transmission tunnel. 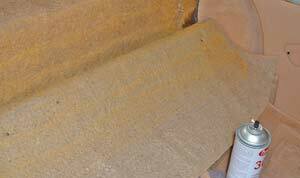 The finished carpet panel showing the scuff area of vinyl. Preparing to install the vinyl pad over the area where the soft top will fold down. The vinyl pad is almost in place. Just a little more to go now, and it pays to be patient. Don't Forget The Door Panels! We didn't, of course. 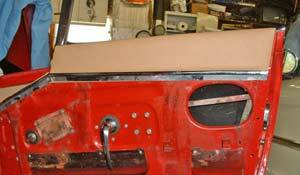 Before putting on the new panels, however, we had to glue in some vinyl trim at the leading top edge of the doors. This was easy to do, since there was a little right-angled piece of sheet metal that was covered by vinyl. 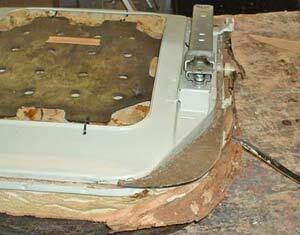 Once we glued new material onto it we simply screwed it into place along with the channel that holds in part of the door panel. The panel is in place. The garnish moulding and channel are in place. 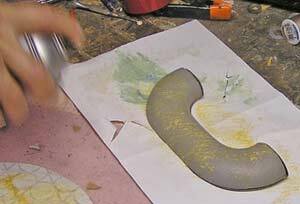 Next came the window garnish moulding. 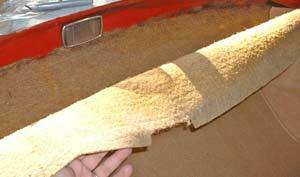 That's what most companies call the piece of trim that you rest your arm on when the window's down. The new mouldings came already finished in vinyl, but most of the time all that's required is to strip the material from the old one and glue new material on. The garnish mouldings were held in place by the screws that hold the upper channel for the panel. The door panels then had to be installed. 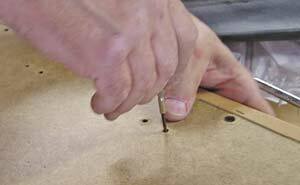 We've shown this exercise before, but suffice to say that you have to make sure the little clips that hold the panel to the door frame are lined up properly with the holes. This is easy to say, but there are usually about 20 of them and the task gets frustrating. Once lined up, however, putting the panel on is just a matter of slipping it in the upper channels and then hitting the area in front of each clip with your hand. The panel snaps in place and then you can reinstall the door and window handles. 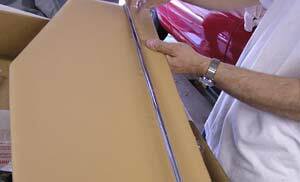 Carefully remove the chrome trim from the door panel. Take your time and don't force anything. Circles show the clips that hold the chrome trim in place. Bend these up before trying to remove them. 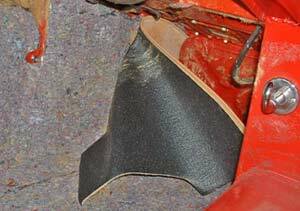 With the upholstery glued onto the panel, we punctured the vinyl for the trim clip tabs from behind to make sure that everything lines up. We carefully align the clip tabs with the holes and push them through, bending the tabs over on the reverse side to hold everyting in place. Pulling the clips into place that hold the door panel onto the door. And now for the armrests. Pretty simple construction with everything being held together with a few screws. 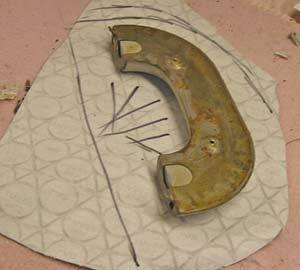 First we cut out our shape, marking where we want to make our cuts. 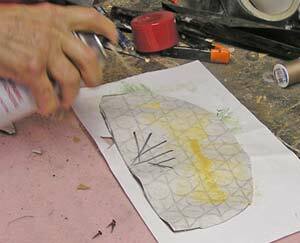 After cutting out our pattern, we then apply adhesive. 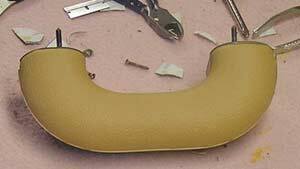 Then we apply adhesive to the armrest. 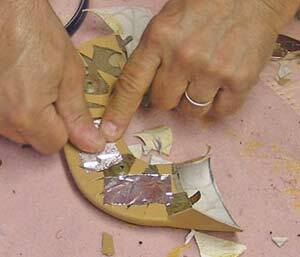 The trick to get a nice, smooth cover is to stretch the vinyl while you glue it onto the armrest. In this case, we nailed it to our bench. 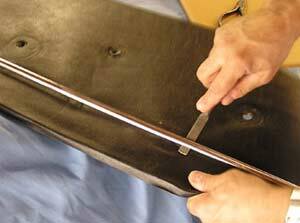 While keeping the vinyl stretched, (here with the aid of our upholstery pliers, firmly press the armrest onto the vinyl. 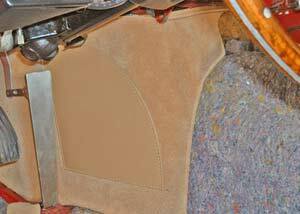 While holding everything firmly together, we cut in V-shaped notches where the material curves around the armrest to prevent puckers. Here we've trimmed away the vinyl for inside and outside curves. 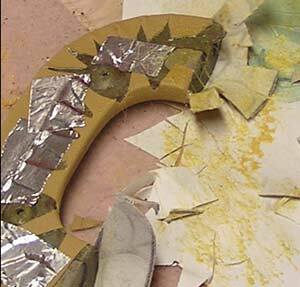 Next we pulled the vinyl snugly over the edge and pressed it into the adhesive. After the vinyl tabs are pressed into the adhesive, we back it all up with reinforced aluminum ducting tape (not duct tape!!) to help hold everything into place. 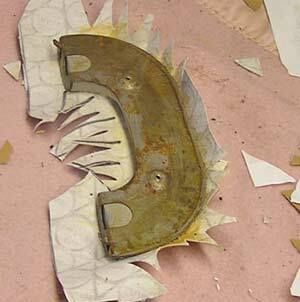 On the ends, we cut away any excess, also to avoid puckering. 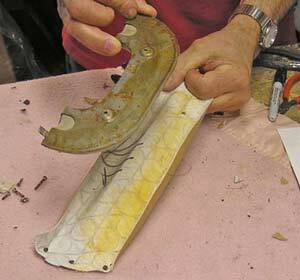 After gluing the ends into place, we re-assembled the armrest. And Now, For The Big Finish! 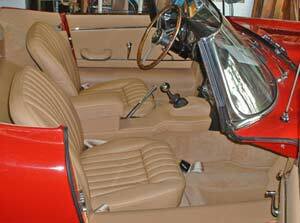 Once the door panels, carpet and trim were in we could reinstall the console and seats. This was a simple bolt-in operation that still managed to take several hours. Anyway, once everything was in place and fastened we stepped back to admire our work. Another view of the finished interior. The cost of materials for this complete interior was about $1500. The time to install it added up to about 40 hours, so that labor has to be added to the materials cost. Having a professional do the work would easily add another $1500 (or more) to the job, so it's definitely worth trying it yourself.